Product categories of Sheave, we are specialized manufacturers from China, Wire Rope Sheave, Cable Sheave suppliers/factory, wholesale high-quality products of Chain Sheave R & D and manufacturing, we have the perfect after-sales service and technical support. Look forward to your cooperation! The pulley is a peripheral groove around the axis of rotation to ferry. By around a central shaft rotating fluted disc and across the disk soft cable (rope, tape, wire ropes, chains, etc.) can be around the center axis of rotation of the simple machines called pulley. In mechanics, a typical pulley (pulley) is a round wheel that can rotate around the center shaft. A groove is arranged on the circumference of the round wheel, the rope is wound on the groove, and the two ends of the rope are forced to be either end of the rope, and the friction force between the rope and the round wheel can cause the circle to be drawn. The wheel rotates around the center shaft. Pulley is actually a deformation, can turn the lever. Pulley is the main function of the traction load, change the direction of the application, transmission power, etc.. A machine which is composed of a plurality of wheels is called a "pulley block" or "a compound pulley". The mechanical interests of the pulley block are larger, and can lead to a heavier load. The pulley can also be a component of a chain drive or a belt drive, which transfers power from one rotating shaft to another. According to whether the position of the central shaft of the pulley can be moved, the pulley can be divided into the fixed pulley and the movable pulley, the central axis of the fixed pulley is fixed, and the central axis of the movable pulley can be moved, each of which has the advantages and disadvantages. And the fixed pulley and the movable pulley are assembled together to form a pulley block, the pulley group is not only labor saving, but also can change the direction of the force. Pulley in junior high school physics teaching in the form of knowledge, the direction of force requirements, rope mobile terminal distance, acting as an answer for solving the problem. 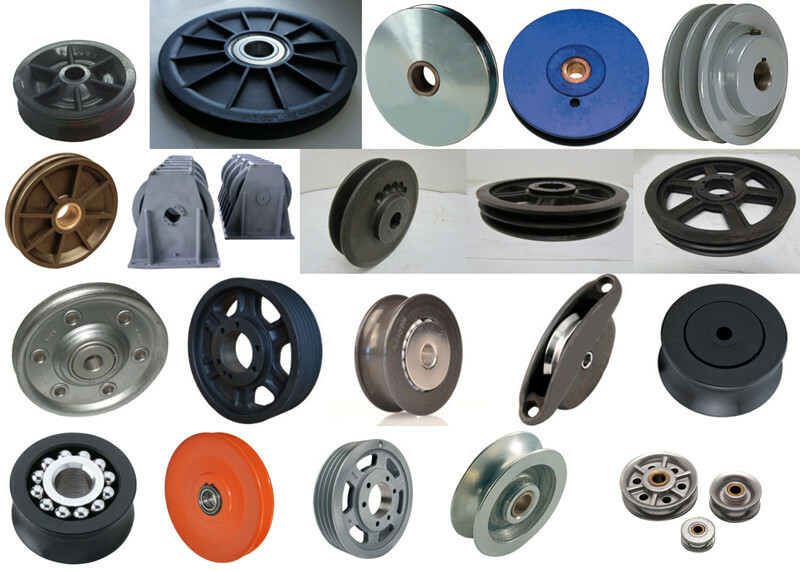 The fixed pulley, the movable pulley, the pulley block (or is divided into the single pulley, the double pulley, the three pulley, the four pulley and so on many wheels and so on many kinds). Wooden pulley, steel pulley and engineering plastic pulley, can be used according to the actual requirements of a variety of materials. Pulling load, changing the direction of the application of force, transmission power, etc..
Hook type, chain type, round type, ring type material and chain type, inclined type etc..
Q235 or cast iron (e.g. HT200).